Since getting into the music blogging world, I've come across some truly great artists that I normally would not have ever discovered. Thanks to blogs like Pigeons & Planes and Sunset In the Rearview, I discovered a producer/rapper named e-dubble. Now, I have already posted some of his fresh tracks before, and people really took a shine to him. It is not hard to understand why e-dubble's popularity has been exploding. He has some insane beats and samples, honest lyrics, and raw talent. E-dubble is music. Maybe what drives me more to his music is he is involved in all aspects of his music, which is great. Yet, he is doing what he loves and has proven that he makes the music he wants. You can tell from his tracks that nothing is forced, nor is he imitating any other artist. There has been quite a lot of anticipation of his mixtape Written Thursday, in fact Twitter was filled with people on my timeline waiting for it. Well, today is the day folks. Written Thursday is here, and it delivers. 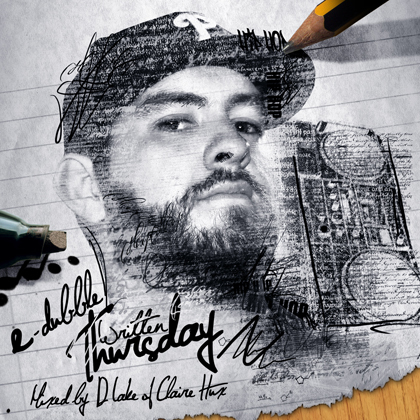 Listen to 'Tired" to get a sample below and download e-dubble's Written Thursday here.